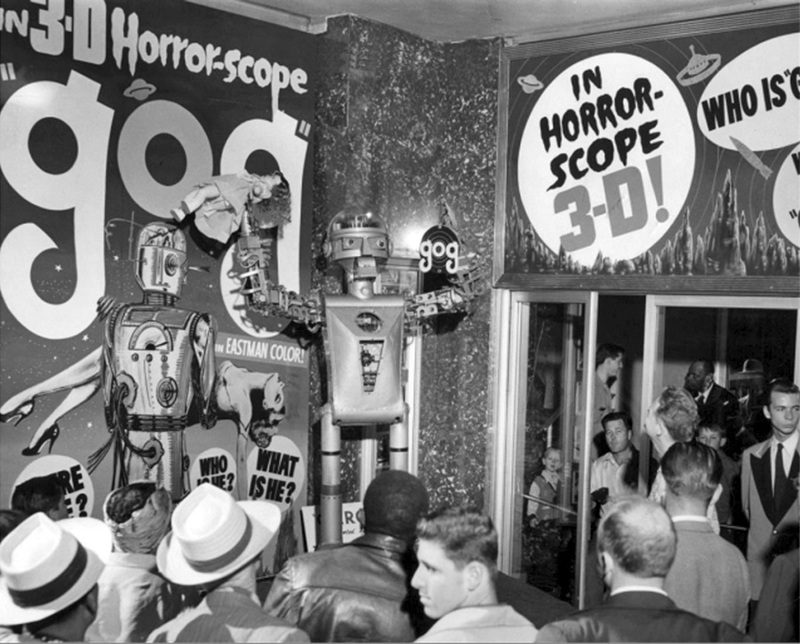 I can't know what it was like to grow up in space-mad early 50's, being born during height of it, and years away from exposure to movies borne of the craze. Sad truth is, I missed best of fun, based on evidence of Gog and ones like it. Well, so did others, based on fact this modest show barely played 3-D in its opener year, and then did a vanish other than pallid TV sans color and square-shaped besides (the original being 1.66). 3-D Archive (see detailed account there) has rescued Gog in true-depth, and Blu-Ray result is again testament to the team behind past The Mask, Dragonfly Squadron, and 3-D Rarities. Had Bob Furmanek and Greg Kintz took quality control during 1953-54's craze, we'd have kept 3-D a lot longer, I suspect. They've not put a foot wrong on any of titles so far tackled by the Archive. I did a same close-on-the-screen sit as with Cinerama and got great effect from Gog's outreach. Many a foreground object fairly fell in my lap, at times it was like sitting smack inside a diorama. Did star-gaze and rocket-obsess inspire youth to work harder at school-science? It might have goosed me, what with 50's dollop of other-world mags, comic books (many of these 3-D), ray guns and other gimcracks (remember "Space-O-Rains" they tied in with This Island Earth?) Gog doesn't gloss over science either. Maybe it's all hooey, as the heaven knows I couldn't fathom data spouted by Richard Egan and others of lab expertise, but it sure sounded like the McCoy tech-wise. But Gog is no lecture; on contrary, it's livelier than I would have anticipated, the pic come to rebirth on heels of faint rep after sixty years in Coventry. Had we seen Gog properly over the gulf, there'd be status-a-plenty, which this one surely merits. Looks like they sold it with emphasis on robots, wise marketing to be sure, as what 50's kid wouldn't choose mechanical men at home rather than brother/sister, or even parents. 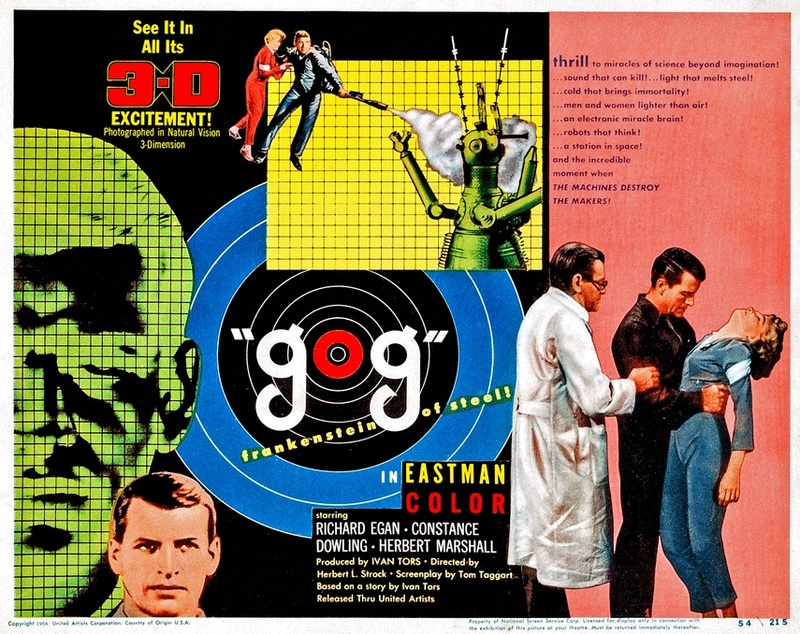 3-D as spent gimmick by mid-'54 put Gog in rentals shade, a bare $278,388K in domestic till, plus $190K foreign. There were 7,284 bookings. 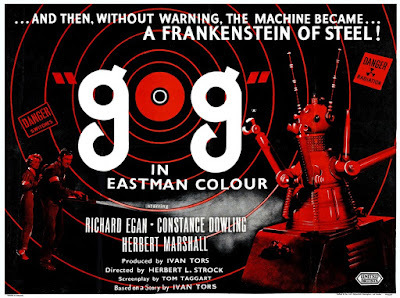 Let's hope fresh thousands will book Gog for home viewing --- it's a real treat, and freshest fruit off vintage vine in many a sci-fi moon. 3D was killed by Theater Owners not by the public. Poor projection mostly. When I took my 16mm cartoon fests across Canada the first time I was assured the theaters I played at first rate projection. They didn't (excepting The Princess Theater in Waterloo, Ontario which is a work of art in itself thanks to owner/operator John Tutt). On top of that the projectionists were too busy watching TV or reading comic books to keep the films in focus. When I objected to a person they said, "I'm not being paid enough." The solution was to get a portable 16mm theatrical projector and to travel with two assistants (one to go from me to the booth and back). Audiences gasped in wonder as they had NEVER seen the films look that great. As a result my programs set house records. The 3D Golden Goose was cooked before it got the chance to lay more than a few golden eggs. Lenny Lipton's advances in Digital 3D paved the way for our current exciting revival. Digital means only one projector need be used thus guaranteeing the all important consistent light intensity. The 3D Film Archive is doing the best film restoration work of everyone in the field including the majors who ought to be using their service for everything. These guys DESERVE to be OVER WORKED. The miracles they work are mind boggling. GOG is a fine demonstration. Those people who have the rights to films like I, THE JURY, BWANA DEVIL, and more (why isn't HONDO on Blu-Ray 3D?!?) should be lining up to have their films saved for posterity by the people best qualified to do the job. It's not as if anyone is going to grow rich overnight from the release of these titles. It certainly is that the art, culture and history of motion pictures is going to be deeply enriched by putting these titles in the hands best qualified to do the work. These guys are not going to live forever. Seize the damned moment. Would love to see this one in 3-D! 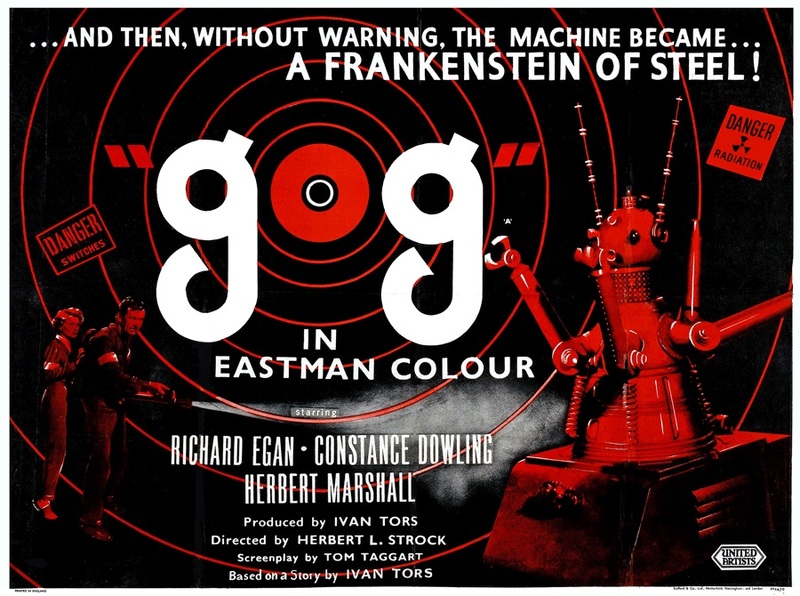 Was well into my sixties before I saw GOG at all, yet this one had made a big impression on me years before. The stills in Famous Monsters Mags didn't look like the usual line of movie robots, their supposedly utilitarian design seemed a tad more believable therefore more scary to my impressionable imagination. Later, when I saw the wonderful marketing materials reproduced (like the great samples you have here) I was bowled over again. They don't look like the usual bug-eyed-monster stuff, a bit more avant garde, almost like classic Soviet poster design. Never saw that great comic strip promo as a kid (would have LOVED that!) The whole tuning fork concept, like the oddball robot-tractor design, is both super-nerdy and super-cool at the same time. 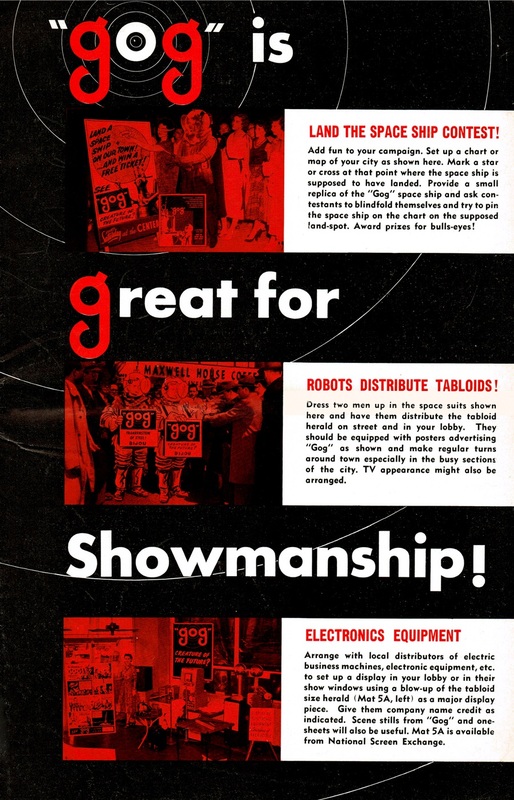 I forget if it was FilmFax or Scarlet Street, one of those magazines had an interview with director Herb Strock (who also worked on "Science Fiction Theater" and other Ziv shows), who spoke at length on "Gog." I edited a movie entitled 'Monster' that Herb Strock directed in the late seventies. His name was taken off and replaced by the producer's. A blessing in disguise as the movie was terrible!